The previous instalment of these CDS Chronicles took us through the Representative Assembly (RA) meeting of 28 September 2008, which included much discussion of Arria Perrault's proposal for a Monastery sim. Arria's proposal was to be the major subject of the next several RA meetings. The RA meeting of 12 October 2008 got off to a slow start, because LRA Justice Soothseeker was temporarily called away in real life to deal with a confrontation between his dogs and a skunk. When Justice returned, discussion began on the first agenda item, which was Arria's proposal for a webmaster position with a stipend. This proposal had been discussed at the meeting of 28 September, and minor amendments had been proposed. The new discussion centered on the clause saying that the webmaster would "update the version of Content Management System as needed, after consultation with governmental users." Arria asked "who are the governmental users?" Were they only the members of governmental bodies, such as the RA, the executive and the New Guild, or did they include the stipended "civil servants," such as the Public Information Officers? There was also some discussion of whether the RA should directly review and approve website operational issues such as choice of hosting provider, software or website design, or leave these to the discretion of the webmaster and those collaborating on the website? Flyingroc Chung observed that the proposal referred to "consultation" with government, rather than obtention of formal approval. The question was finally resolved by replacing the words "government users" with "heads of each branch of government." The amended proposal was unanimously approved. Jamie added that Alexicon Kurka had agreed to fill the position. The next item was Arria's proposal for purchase of a "void" sim, to which the Monastery would be relocated. Arria referred to the latest version of her proposal set out on the CDS forum, which would place the new void sim between Alpine Meadow and Locus Amoenus, thereby filling the "hole" under the Alpine Meadow sim. Arria noted that the Monastery was an NGO, and that this project could be a model for other NGOs to develop, without CDS having to take a large financial risk. Justice Soothseeker asked whether the Monastery's status as NGO was really relevant, since other citizen groups could ask CDS to purchase a void sim, and then fully pay for it. Jamie noted that any group that was willing to pay could also propose to develop a new sim under the Private Development Act. Gwyneth Llewelyn mentioned that land ownership by a chartered NGO would sidestep limitations on the quantities of CDS land that can be owned by individual citizens. Moon Adamant confirmed that that limit was 4096 m2 per sim and per avatar. But Jamie noted that there was no limit to group ownership of land, which already allowed widespread sidestepping of any theoretical ownership limits. Jamie referred to his own forum post, which set out a way to implement Arria's proposal under the Private Development act. Jamie specified what he perceived to be three remaining points of disagreement between himself and Arria. First, instead of the Monastery being a seventh paid parcel, Arria wanted the six paid parcels to fund the void sim, with the Monastery being on public land, thus paying no rental. Second, Arria persisted in wanting the new sim to be implemented under the standard procedure, rather than under the Private Development Act. And third, while Arria agreed that the proposal must conform to the General Master Plan, she failed to explain how the sim's terrain and its parcel plan would be confirmed by the Guild and the relevant branches of government. Jamie observed that the deciding bodies usually see a map and a parcel spreadsheet before they commit to a sim purchase. However, the Private Development procedure shortcuts that by letting the developer terraform and landscape before any review. Gwyneth and Moon, following Jamie's lead, asked Arria if she could reconcile her proposal with the Private Development Act. For example, according to that Act the Monastery NGO should pay 4 months of tier in advance. Arria replied that she would pay those 4 months in any case, and would continue paying if the six other plots failed to generate sufficient revenue. Why should she be required to pay tier in advance? Gwyneth noted that the Private Development Act in fact provides two separate models. The first model allows the private developer to acquire the sim, while the second model allows the private developer to "donate sufficient money to the CDS estate owner to allow the CDS to acquire a sim." Gwyneth suggested that Arria seemed to want to follow the first model, but since only those who already own a full sim can buy a void sim, Arria's group would have to follow the second model. But Arria insisted that she wanted to follow the model of normal sim development (but with a void sim, and with an NGO as major occupant of public land), rather than private development. In exasperation Arria asked: "If people know so well how the law is, why don't they help me to make a good proposal?" Gwyneth admitted that Arria's project could be seen as a regular, CDS-promoted sim, but with only 6 plots for sale in a void sim, and a Monastery on public land. Yet Gwyneth thought that the Monastery group wished to speed up the process by entering the land business themselves. Moon asked whether the Monastery was public or private? Arria replied that the Monastery had been private since its inception, but that she thought it should now become public, in light of its contribution to the CDS image and activities. To which Moon replied that if it becomes public, it must follow the public process. Jamie tried to sum up the two main options: development under the Private Development Act, or under the standard procedure used for Alpine Meadow and Locus Amoenus. Arria's proposal would fit under Private Development, except for the four month advance, and the manner of submitting the parcels and rents for approval. Perhaps the requirement for the advance could be waived, since Arria proposed to fully rent the parcels, thereby reducing the financial risk, and perhaps the table of parcels and rents could be submitted prior to purchase, thereby permitting full review by CDS. The process would then be quite similar to that of the standard procedure, whereas the standard procedure would require more work for the Guild, and would therefore take longer to implement. Justice suggested that Jamie as Chancellor should continue to refine the possibilities. Jamie therefore proposed to come back to a future RA meeting with details about Arria's map, showing parcel sizes, purchase prices and rental rates. Gwyneth however suddenly suggested that this project should fall under the In-Theme Expansion Act (NL 8-2). (I found this surprising, because Gwyneth up to this point seemed to be pushing Arria to admit that her project fell under the Private Development Act. But rereading the above carefully I concluded that Gwyneth and Moon had in fact been steadily undermining the Private Development option.) Gwyneth immediately formulated her suggestion as a motion, which Pip Torok seconded. Jamie, who had been championing a modified Private Development approach, predictably objected against taking a premature vote. "I wouldn't APPROVE before you have plans of the table," he said. And after a moment of reflection, he added wryly: "I see that if you use NL 8-2 it is the RA not the executive who decides." Gwyneth replied that the proposal was only for the RA to approve the project on general terms. Then RA would decide on the preliminary configuration (such as a void sim south of Locus Amoenus), and would commission the NG to draft a plan to be presented to the Chancellor. The motion would thus only initiate what NL 8-2 calls the "Preparation Phase." And Arria was quite satisfied with Gwyneth's proposal, because she had all along insisted that she wanted to avoid the Private Development approach. Jamie respectfully took his leave of "those who feel better able than himself to make such detailed legal analysis on the fly," cautioned against adopting motions with unexplored consequences, and concluded: "Please keep any approval CONTINGENT on a later approval from SOMEONE." 1) The RA supports the idea of acquiring a 5th sim, which would be a void sim next to AM. 2) The RA also supports the idea of the Monastery occupying public land on said void sim. The vote was called. Gwyneth, Pip, Arria and Justice voted "aye," and Bells Semyorka voted "nay." The motion carried, and the meeting was adjourned. The RA meeting of 26 October 2008 began with discussion of meeting times for future RA meetings, taking into account upcoming real-life events such as Halloween, the US presidential elections, and Thanksgiving. 7) any other infrastructure that can serve the interest of the community and territory. Arria replied that she already had most of that information. Gwyneth observed that it would be nice to have it all as a document, or in a forum post. Arria said she planned to provide such a document, but was still working on it. Jamie noted that Arria had at each stage provided everything the others had asked for, but that the RA decision to apply NL 8-2 had added new requirements. The next step was Guild review of Arria's submittals. Jamie noted that Gywneth's point seemed to be that Arria should provide this information FIRST to the RA, and THEN to Guild. He suggested that Arria at least present a brief summary. So Arria rezzed a topo map of the new sim, and began explaining the layout. The six rental plots would be in a fishing village near the sea, at the same general elevation as Locus Amoenus. The new Monastery would be up the slope, at about the same elevation as the old Monastery on Alpine Meadows. A small cascade coming from under the monastery would feed a lake, which would in turn feed the river flowing into Locus Amoenus. There would be a total of seven plots, since Virtus would rent a small plot corresponding to the library of the Monastery. Jamie questioned whether seaside rental plots would sell well, since CDS experience was that upland Alpine Meadows plots sold much better than lowland plots in Colonia Nova or Locus Amoenus. Rose worried that all of the proposed plans would overload the one OpenSpace (void) sim. Arria then summarized the financial details. Each of the six rental plots would have an area of 512 m2, a prim count of 250, and would rent for 12 US$ per month. Virtus would pay 15 US$ per month for the library plot. The available prims would be allocated as follows: 40% to private land, 10% to NGO land (Virtus), and 50% to public land. The public infrastructure would include the lake (skating area in winter) and a ski slope. Sonja Strom said that she liked the project, but it seemed to go against the Master Plan concept for this area. Arria replied that, as Symo Kurka had stated, the Master Plan is just a guideline. Justice cut the discussion short by saying that the time for this item was up, and that it was precisely the role of the impending New Guild review to determine how well the project fits with the Master Plan. The subject was tabled. Next on the agenda was the Chancellor's report. Jamie began by announcing that Sonja had been appointed as Land Caretaker. He then noted that a small influx of new citizens had resulted from Oktoberfest and other recent events. Jamie noted that most of the recent sales were turnover in Neufreistadt: the Fachwerken and scenic places get bought fast. Arria asked whether the plots for sale in Colonia Nova (these seem to be the large plots put up for sale by ThePrincess) could be an opportunity to start the plan for economical development. But LRA Justice Soothseeker announced that he had to leave, so Jamie proposed to share his further thoughts about the new sim at the upcoming Guild meeting. Jamie instead opened a broader discussion of expansion possibilities. 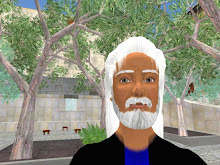 The economic market for traditional rentals seemed uncertain, but Jamie identified three other alternatives for CDS expansion: 1) Arria's proposal, 2) another void or two for scenic and perhaps NGO use, and 3) potential joining with Al Andalus, another democratic community in Second Life. Concerning the third alternative, Jamie mused on the difficulty of arranging a successful merger, without CDS overwhelming Al Andalus like a colonizing conquistador. Patroklus Murakami expressed his astonishment at the announcement of this third possibility, asking: "As afar as I know, it's the first time this idea has been aired publically?" Jamie shifted to the last, minor, item of his Chancellor's report. During the Okotoberfest he had expanded the main CDS information center in Neufreistadt by donating his own lot next door to it. He proposed that the RA at the next meeting could approve a swap, taking Jamie's plot for the information center, and giving him in exchange the underused "store for citizen's" on the other side of the Platz. The Chancellor's report being finished, and the LRA Justice having departed, an informal discussion followed on the possible merger with Al Andalus. Jamie said that since CDS was a faction-based system, he expected to be talking to each faction about the Al Andalus question. Patroklus asked Jamie what approach he had had from Al Andalus. Jamie replied that there had only been informal chat, which had already revealed multiple possible conflicts of interest, since many CDS citizens also own land in Al Andalus. Jamie answered Patroklus by pointed to interests shared by the two regions : self governance, strong scenic themes, and general non-profit status. But there were also incompatibilities: the Al Andalus theme is very different from those of CDS, and the spirit there is much more communitarian and less fractious than in CDS. Patroklus called for discussion about this idea on the forum. He saw the way the news was introduced as evidence of a lack of transparency in government. He noted: "It's clear that some have been talking about it for a while." Jamie's replied that he would not make any forum postings until there was something appropriate and conspicuous to announce, because Al Andalus members can read the CDS forums. The discussion degenerated into a heated personal confrontation between Patroklus and Jamie. Moon interrupted to say that she found the possible merger very interesting from an urbanism point of view: it would allow testing of Symo's General Master Plan notion of clusters. Gwyneth intervened to reassure Patroklus that Jamie's presentation was just an open announcement of prior discussions, rather than any kind of formal proposal. Rose's second announcement was that the CDS guided tour Owl was now working, as can be seen in a video by Gwyneth Llewelyn. (Note: the preceding link unfortunately reverts to Gwyneth's video about Damien Fate's Locus Pocus - you have to search for "Tour of the Confederation" in the list of videos at the right of the screen). The third announcement concerned Gwyneth's discussion series held in the Neufreistadt Kirche. Ah, the memories still linger even after the aroma has faded!